Part of the aging process (I won’t go as far as to say “maturing”) for me has been letting some of my sports fandom fall by the wayside. I’m down to about two sports now: MLB and the NFL. However, there was a time when I was well-versed in the world of college basketball. I could have named the starting lineups for most of the top ten teams, or at least the ones east of the Mississippi, and I certainly knew the head coaches of just about every school in the top 25. Today, my interest in college basketball pre-March is minimal at best. I follow the University of Richmond, and I’m vaguely aware of how other state schools are doing. VCU is essentially ubiquitous at this point, and knowledge of their performance will seep through whatever informational filters any Richmond resident has, even if one tries to avoid it. Trust me. To be fair, it was easier to keep track of college basketball when the best players often stayed for four seasons, and always stayed for at least three. Likewise, a single conference conveniently included almost every D-I school in the state when I was 15. That also helped. Filling out a bracket and entering NCAA Tournament pools has become more “expensive chore” than “fun game” over the last decade. Yet, despite my lack of knowledge and interest, I feel like my actual chances of winning haven’t decreased a bit. Such is the absurdity magic of March Madness. Although I don’t know much about college basketball, I do follow ESPN and Sportscenter on Twitter. And it seemed like I was getting “UPSET ALERT!! !” tweets on a daily basis, announcing that whoever was the #1 team in the country that week had been defeated. Sometimes more than once in the same week. The point is that I think there’s more upset potential this year than in any other. That’s not surprising, given the structural changes in the game that have led to more parity. Generally, the most talented teams have fewer juniors and seniors, and the less-talented teams do. Programs with three-plus-year players and well-run team concepts and schemes have a much easier time competing with the “elite” programs than they did when I was growing up and everyone had those elements. Add to the mix that the rise of AAU culture has players beginning college, especially at the top programs, with fewer fundamentals and team concepts, and there has been a great leveling of the playing field over the last 20 years, and particularly the last 10. While that may sound great in theory, it’s part of the reason I’ve disengaged from college basketball. As for my bracket, you’ll note that, despite all the talk about parity and upset potential, I still wound up with no one lower than a three-seed making it to the Final Four. This is why I’m bad at this, deserving of mockery, and will win nothing. But perhaps my “secondary” bracket (which I only enter in my money pool) will yield better results . . .
You’ll note that there are a few more upsets along the way, but my effort to include more underdogs ultimately backfired, as I wound up with THREE top-seeded teams in the Final Four, along with Saint Louis. 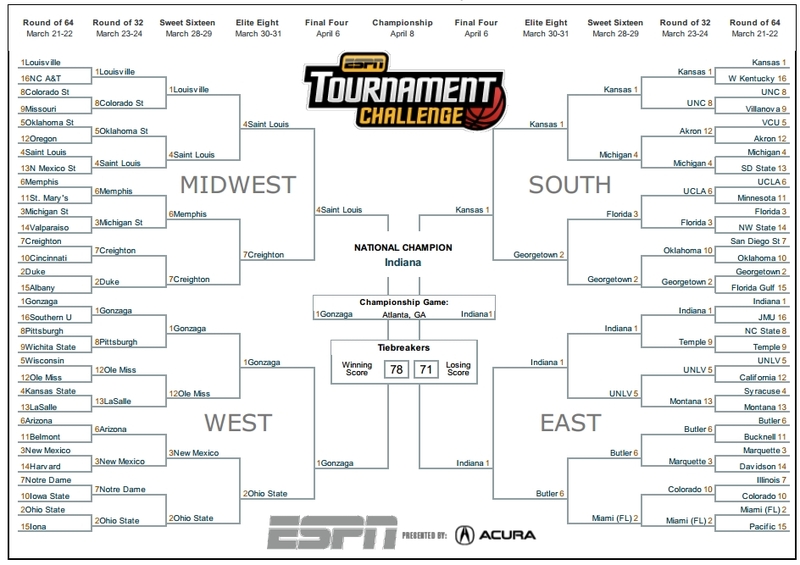 Still, this one may have a better shot than my primary bracket, as I put more of an emphasis on hot teams. I also accepted the widely-discussed premise that the Big 10 is the best conference in the country. I think that matters a lot. In my first bracket, I have Miami (FL) losing to Ohio State in the finals, while the second sees Indiana topping Gonzaga. My first bracket also has five Big 10 teams getting to the Sweet 16. That’s also why I have VCU losing in the Round of 32 (to Michigan) in both brackets. Another rule I follow is a petulant rejection of teams that have burned me in the past. I assume that the performance of teams to which I have no connection, and which, furthermore, have no players in common with this year’s squads is something I should definitely take personally. Correct? I am surely well-within my rights as a non-fan to feel betrayed by teams that I’ve tabbed as favorites, only to watch them flame out in the second or third rounds. I’M LOOKING AT YOU, LOUISVILLE!!! The long and short of it is that I don’t know what the hell I’m doing, but, as history has shown year after year, that is no bar to performing well in NCAA Tournament pools. I’m hoping the good angels of dumb luck will be on both shoulders as I navigate my way through a postseason that seems ever-more-foreign to me as I speed towards middle age, reminiscing about “real” college stars like Patrick Ewing, Danny Manning, Grant Hill, and Larry Johnson. In other words, congratulations to 2013 NCAA Basketball Champion Louisville Cardinals! One thing that I despise more than anything else about the “modern” tournament is the NCAA trying to enhance the play-in games by referring to the old first round as the “second round.” That is exceptionally frustrating and confusing. This entry was posted in Commentary, Sports and tagged AAU, Basketball, Brackets, College Basketball, Commentary, Gambling, March Madness, NCAA Tournament, Sports, University of Richmond, VCU. Bookmark the permalink.